Are you a bud connoisseur, or perhaps just looking to expand your palate and try out some new strains of that favorite sticky icky. Whatever your prerogative is, there are no shortages of strains out there for you to partake in. This guide will help you learn more about the “Chemdawg” strain, what it’s like, how it feels, and other important aspects that will aid you in figuring out if its worth a try (we think it is). Chemdawg is a Sativa-dominant hybrid strain that has really made a name for itself in the cannabis industry. This legendary strain has become a popular choice amongst marijuana users across the U.S for a great many reasons. Among those reasons is its high THC content (which has been reported at up to 26%), unique taste and an energetic high. Chemdawg has also been leveraged in breeding campaigns to create a number of other popular hybrid strains. In fact, Chemdawg is the parent strain of many buds you’ll probably recognize, including fan favorites such as Sour Diesel and OG Kush. The origin of this strain is a little hazy (pun intended), which gives it a mysterious edge (and who doesn’t love a good mystery?!). There are plenty of weird and wonderful rumors going around that claim to detail the birth of Chemdawg. Some say that it all began with Colorado-based growers P Bud and Jo Brand, who are known for growing a strain they named ‘Dog Bud’. The strain was thus reportedly named due to its effect of making smokers roll around on the ground like a dog. The ‘chem’ part of the name is given due to the unique chemical smell that it possesses. The story further details that the duo got an East Coaster into the strain at a Grateful Dead concert. After the concert, the three stayed in touch, with the Bud and Brand later sending their East Coast pal some of the herb. The East Coaster supposedly found some seeds in a batch that would later be known as the ‘chem line’. Most people will now recognize Chemdawg from its distinctive scent. How much (or little) of that tale is true is up for debate. But one thing is certain, Chemdawg has one heck of a backstory, true or not. Chemdawg is a notoriously powerful, legendary hybrid strain and as we’ve mentioned, it has a vague genetic history that has yet to be verified. Chemdawg is thought to come from two parent strains of Sativa, one from Nepal and one from Thailand, due to identified similarities. It is thought that this ghost strain is possibly the result of years of experimentation, resulting in a strong and punchy hybrid that is not to be underestimated. Growing Chemdawg from seed or cuttings is notoriously difficult and it is recommended that only a professional grower should attempt it. If you are a novice and you’re up for the challenge, then don’t let this put you off. As long as you have time to dedicate to this project, do your research and you can still see positive results. The difficulty of growing Chemdawg has led to a number of ‘offspring’ strains, which were bred to enable less experienced growers to successfully grow a product with the same potency of Chemdawg, but with less labor required. Conditions need to be primed and monitored for best results. Time to Flower: Chemdog flowers and is ready for harvest in seven to nine weeks. Appearance: Chemdawg plants will grow fairly tall, with long, tapered, medium-sized buds. It is famous for bold green, fan-like leaves which are a light green colour. The pistils and stigmas are orange in colour and insect-repellant Trichomes, which will kill or deter predators. Growers, this one will be a sight to behold! Grower Difficulty Level: This strain is notoriously tricky to grow. One for the more experienced growers out there. Preferred Climate: Chemdawg grows best in sunny and dry conditions. Humidity levels must be carefully controlled and a good, natural soil type is desirable for best results. Outdoor vs Indoor Growing: This plant can be grown indoors or outdoors or indoors. If grown in a carefully cultivated, sunny and dry environment, you can expect a bumper crop of 28 ounces per square metre. If Chemdawg is grown in sunny and dry outdoor conditions, growers can expect to harvest a massive 35 ounces of weed per plant. The smell of Chemdawg is what gives the strain its name. You’ll love it or hate it. Users describe this strain as possessing a powerful chemical or diesel smell. Chemdawg hums of fuel, a smell which some describe simply as ‘chemical’. It has notes of lemon, earth and pine. Growers who are conscious of odor control should invest in suitable equipment before growing this strain. If you can make it past the pungent scent, you’ll no doubt find this to be a real taste sensation! The strong effects of Chemdawg are what makes it such a legendary strain. It is a great all-rounder for anyone who is after a potent high. The effects of this powerful pot strain can have you whizzing through your chores in no time. It is a sociable strain, providing inspiration and creativity to the user and stimulating many productive and soul-searching conversations. Of course, as with many natural remedies, the effects of Chemdawg will vary for each individual. The high experienced by Chemdog users can be very instant and intense. The sativa traits give a clear, head-based effect. Although it is fast acting, this strain grows in intensity to reach the full impact. Some find the initial high to be disorientating and this may not be the best strain for the more inexperienced cannabis user. Users commonly report feeling relaxed, happy, uplifted, creative and euphoric. This euphoria can increase creativity in some users, making it a great strain to use if you’re in the creative period of a project. Chemdawg will help you to relax and enable your creativity to flow. If you suffer from social anxiety, Chemdawg can help you to have more engaging and intense conversation. Chemdawg marijuana can also help you to feel more at ease in social situations, helping you to relax and enjoy being around others. Many users report that this strain makes them talkative but without the ‘racey’ edge of some. After the initial euphoric high, you may experience a period of mental and physical calm. This relaxed feeling occurs without lethargy of drowsiness, despite the potency of the high. This strain can put even a serious insomniac to rest, so if you are planning further activities after using Chemdawg, be sure to manage your dose so that you are able to continue with your plans. Chemdawg is commonly reported to reduce stress, depression and pain, it can combat lack of appetite and is reported to reduce pain caused by headaches and migraines. Some first-time users may find that the initial effects of Chemdawg can be a little difficult to relax into at first. We always recommend trying a small amount at first and building up from there. After a short time, you should be able to relax and enjoy the sensation, or get your productivity in full swing. The high THC level of Chemdawg makes it an effective way to treat a variety of symptoms. It can relieve physical pain and mental discomforts. The anti-inflammatory properties of Chemdawg Marijuana can relieve musculoskeletal pain including pain from arthritis or Carpal Tunnel Syndrome. Chemdawg also has the power to relieve Neuropathic pain caused by peripheral neuropathy, fibromyalgia and pain caused by Multiple Sclerosis. Chemdawg is often used as a treatment to relieve the symptoms of stress, helping you to relax and recuperate after a busy day or ahead of a stressful week. Prolonged stress can lead to anxiety and depression and the relaxing properties of Chemdawg Marijuana can help users to recharge and prevent the user from developing anxiety or depression. Chemdawg marijuana can help to relieve symptoms of anxiety and depression. Users report elevated mood and released tension, which offers some much-needed respite from their symptoms. Chemdawg can help to reduce psychomotor agitation in ADHD patients. It can also help to reduce tension and dysphoria that can occur in people with ADHD. 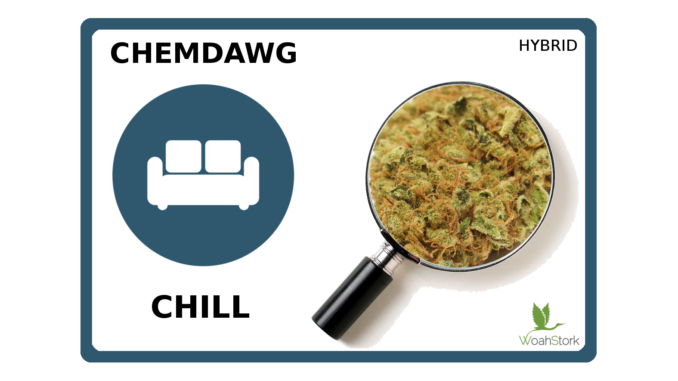 Chemdawg can provide the user with a feeling of relaxation that can aid restful sleep in even chronic insomniacs. Chemdawg can be a powerful way to combat nausea caused by chemotherapy. It can also improve appetite which makes it an effective treatment for anyone suffering from lack of appetite. The duration will last a few hours so make sure that you aren’t planning to drive or operate heavy machinery at this time. The side effects associated with Chemdawg are minimal in comparison with prescribed opioids. The high levels of THC in this strain can cause users to experience dry mouth, dry eyes, anxiety, panic attacks and paranoia. Chemdawg can cause anxiety and panic attacks in those who are prone to these things already. We would always recommend that any users who are new to marijuana should proceed with caution. Even regular smokers may find this strain particularly potent. There’s no doubt that Chemdawg packs a powerful punch. This stuff is potent. THC levels can reach 26%. Head on over to WoahStork’s online cannabis marketplace where you can find Chemdawg for sale online from dispensaries in your area. 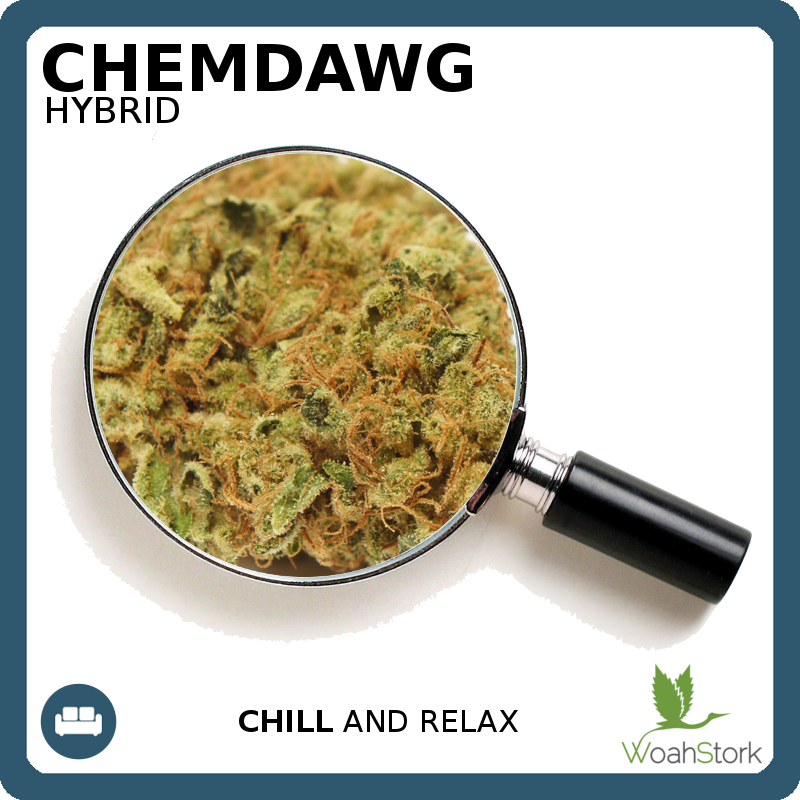 WoahStork allows for you to find flower, edibles, concentrates, vape pens, and more with Chemdawg, so get shopping today! There’s a reason why Chem Dawg is such a famous strain of marijuana. Probably best recognized by its pungent aroma, this popular of this hybrid has become a real favorite amongst users. The amazing cerebral effects of Chemdawg make it a favourite and it can be used for both recreational and medical purposes. If high potency isn’t your thing, then perhaps give this a miss. But if you’re a passionate pot-user and you haven’t yet tried this strain, what are you waiting for?